Pictured from left are Sue Winston, Fruth Pharmacy, Lynn Hopkins, Fruth Pharmacy, and Diana Wright, assistant manager, Fruth Pharmacy #3, with Sarah Harrigan, MSN, RN, OCN, oncology service line director, Holzer Center for Cancer Care, and Melissa Burris, RN, clinical coordinator, Holzer Center for Cancer Care. 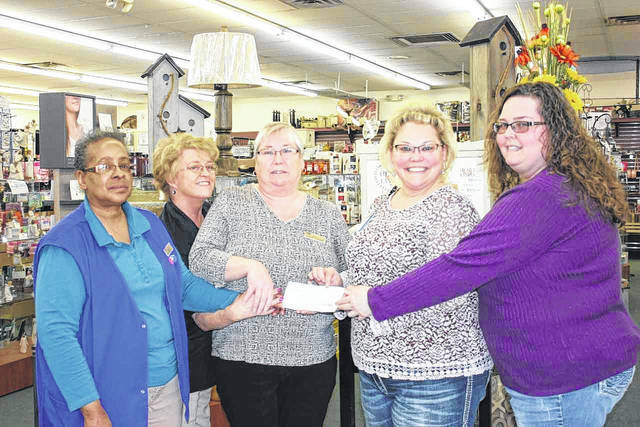 GALLIPOLIS — Holzer Center for Cancer Care recently received a donation from Fruth Pharmacy #3, located on Jackson Pike, Gallipolis, Ohio. Fruth Pharmacy staff held an outdoor event in the Fall 2017 to raise funds for the Holzer Center for Cancer Care Patient Fund, which provides gas cards and other assistance to patients while receiving treatments. Over $1,800 was donated to this cause, which was presented to the Center recently.